Due to the peculiar rock formations in the area, a series of natural “blow” or “puffing” holes exist (and still do to this day) which causes the sea water, when tidal conditions dictate, to crash through and blow water upwards. It is believed that as far back as the 1700s locals thought these to be haunted by the fairies with the result of the name “The Fairy Bridges”. 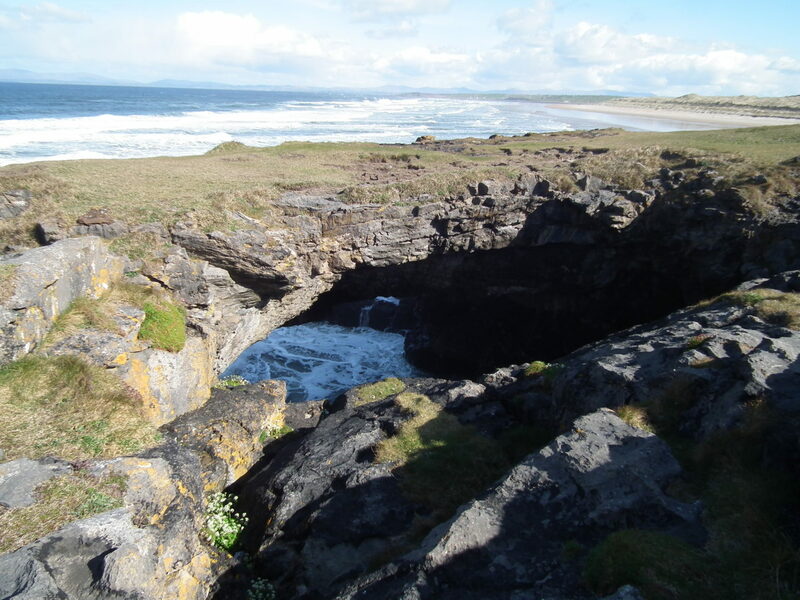 Early travellers to the area, once Bundoran began to get a name for itself in the 1820s, were thought to be more interested in coming to the seaside town to see the Fairy Bridges than to experience the natural health benefits of the area’s golden beaches and proximity to the wild Atlantic Ocean! 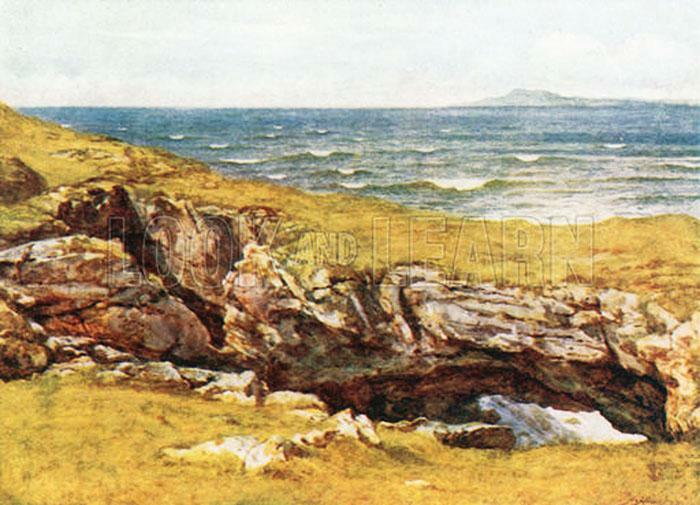 Indeed the natural rock formation was one of the main things to see in Bundoran at the time! The Fairy Bridges was depicted in a painting in 1891 by famed Victorian artist Helen Allingham. This extract is taken from the book “Happy England – As Painted By Helen Allingham” first published in 1903. 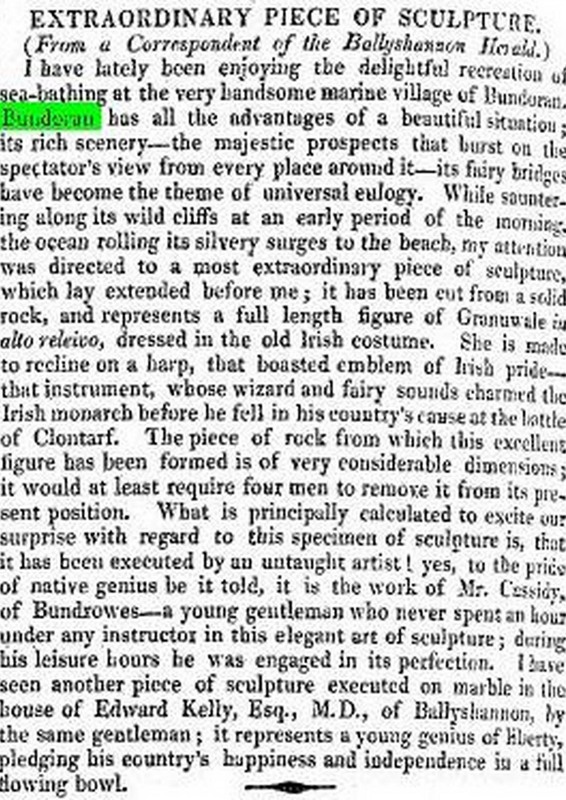 “The Fairy Bridges – a series of natural arches, carved or shaken out of the cliffs, in times long past, by the rollers of the Atlantic are within a walk of Ballyshannon, and were often visited by Mrs. Allingham during her stay there“. ONE time three women from Mullaghmore went to the fair of Bellashanny to sell linen. The linen was in rolls that they carried on their backs, and they had to start out very early, long before daylight, to be in time for the fair. As they went along the road one woman said she wanted a drink. They could see no light in any house till they came to Finner, and the woman went to the house where the light was to ask for a drink, and the other women went with her. When they came into the house they saw a man there, and he asked them where they came from and what they wanted. And when they said that they came from Mullaghmore, he began to ask them about people in Mullaghmore, and they wondered that a man who lived so far away should know so much about the people in Mullagh. One of the other women said to the woman who wanted the drink, that it might not be a right house, and that she ought not to drink anything in it. So they went away and they began talking about the man and what they had heard, and they thought it might be a house of the ” good people.” So they said : We’ll put stones here to mark the place, and we’ll see what sort of a house it is when we are coming back in daylight. 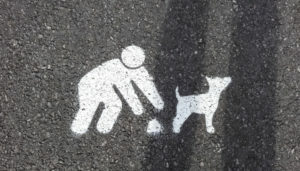 So they made a pile of stones on the roadside to mark the place, and when they came back in the daytime they found the stones where they had put them, but there was no sign of a house there at all.